An angel (from Greek: ἄγγελος, ángelos, meaning "messenger") is a supernatural and ethereal being found in many religions, whose duty is to serve and assist God. Angels typically act as messengers but can perform other tasks such as keeping records of humans' actions, acting as guardians, announcing God's decrees, and waging battles against demons. In some religions, hierarchies of angels are said to exist to help God govern the cosmos and human affairs. The belief in powerful and benevolent spiritual beings is an ancient and common feature of most world religions, but only in the Abrahamic religions are they called "angels." In the Bible, angels appeared to Abraham, Jacob, Moses and the prophets, to Joseph and Mary and to some of Jesus' disciples, announcing to them what God is doing. An angel wrestled with Jacob; another angel released Peter from prison. Today, belief in angels, especially the popular idea of guardian angels, is deeply comforting to many. In contemporary literature on angels, ordinary people frequently report experiences of angelic help. Some writers recommend calling one's personal band angels to help one through the day. However, not all angelic beings are good. Many religions teach of rebellious and evil angels and see angels as catalysts in the fall of humanity, leading to the predicaments of evil and sin. In the Hebrew Bible and the New Testament, angels are a spiritual aspect of God's creation; they exist to execute God's will. Angels reveal themselves to individuals and nations, in order to announce events to affect humans. Angels foretold to Abraham the birth of Isaac, to Manoah the birth of Samson, and to Abraham the destruction of Sodom. In the New Testament, the angel Gabriel announced to Mary the birth of Jesus. An angel appeared in front of the empty tomb, announcing Jesus' resurrection (Luke 24:4). Guardian angels were also mentioned: God sent an angel to protect the Hebrew people after their exodus from Egypt, to lead them to the promised land, and to destroy the hostile tribes in their way (Exod. 23:20, Num. 20:16). In Judges 2:1, an angel of the Lord addressed the whole people, swearing to bring them to the promised land, and as God watched over Jacob, so is every pious person protected by an angel, who cares for him in all his ways (Ps. 34:7, 78:25; 91:11). In the Hebrew Bible the name for angel is "malakh" ( מלאך), which obtained further signification only through the addition of God's name, as "angel of the Lord," or "angel of God" (Zech. 12:8). Angels are referred to as "holy ones" (Zech.14:5) and "watchers" (Dan. 4:13). They are spoken of as the "host of heaven" (Deut. 17:3) or of "Yahweh" (Josh. 5:14). Other appellations are "Sons of God," (Gen. 6:4; Job 1:6, 5:1) and "the Holy Ones" (Ps. 89:6, 8). The hosts of angels are the Benē Elim—i.e. members of the class of divine beings, possessing great power. Yet as they were distinct from Yahweh they were inferior and ultimately subordinate (e.g. Gen. 6:2; Job 1:6; Ps. 8:5). God was firm about maintaining a sharp distinction between God and angels, and consequently the Hebrews were forbidden by Moses to worship the "host of heaven." It is probable that these "hosts" were also identified with the armies of Israel, whether this army is human or angelic. An angel of the Lord (Mal'akh Yahweh) was an appearance of Yahweh in the form of a man, and the term Mal'akh Yahweh was used interchangeably with Yahweh (cf. Exod. 3:2, with 3:4; 13:21 with 14:19). Those who saw the Mal'akh Yahweh said they had seen God (Gen. 32:30; Judg. 13:22). Such a personage appears to Abraham, Hagar, Moses, and Gideon, and leads the Israelites in the Pillar of Cloud (Exod. 3:2). The appearance of Yahweh to Abraham and Lot in Genesis 18-19 is connected with three "men" or messengers; but their leader is Yahweh himself. Similarly the "man" who wrestles with Jacob is identified as God (Gen. 32:24, 30). The tradition of interpreting such messengers as an "angel of the Lord" may have arose as a means of avoiding anthropomorphism. At Bethel, Jacob sees the angels of God on the ladder (Gen. 28:12). In this and similar cases the angels are connected with or represent a theophany. Angels are full of knowledge (2 Sam. 14:17, 20), yet they are not infallible (Job 4:18). Avenging angels are mentioned, such as the one in 2 Samuel 24:15, who annihilates thousands. It would seem that the pestilence was personified, and that the "evil angels" mentioned in Psalms 78:49 are to be regarded as personifications of this kind. There are militant angels who smite the whole Assyrian army of 185,000 men (2 Kings 19:35). Regardless of their disposition towards humans—whether to guide or to punish—angels act in God's service. They also glorify God, whence the term "glorifying angels" comes (Ps. 29:1, 103:20, 148:2; cf. Isa. 6:2). Angels constitute God's court, sitting in council with God (1 Kings, 22:19; Job 1:6, 2:1); hence they are called God’s "council of the holy ones" (Ps. 89:7). They accompany God as attendants when God appears to humans (Deut. 33:2; Job 38:7). Angels are sometimes referred to in connection with their special missions as, for instance, the "angel which hath redeemed," "an interpreter," "the angel that destroyed," "messenger of the covenant," "angel of his presence," and "a band of angels of evil" (Gen. 48:16; Job 33:23; 2 Sam. 24:16; Mal. 3:1; Isa. 63:9; Ps. 78:49).In the Book of Zechariah, angels of various shapes are delegated "to walk to and fro through the earth" in order to find out and report what happens (Zech. 6:7). In 1 Kings 13:18, an angel brought the divine word to a prophet. In some places it is implied that angels existed before the Creation (Gen. 1:26; Job 38:7), as God's helpers. Ezekiel, in one of his visions, he sees seven angels execute the judgment of God upon Jerusalem (Ezek. 9:1-7). Some scholars, connecting the seven angels of Ezekiel with the seven eyes of Yahweh in Zechariah 3:9 and the later doctrine of seven chief angels (Tob. 12:15; Rev. 8:2), find a parallel to the seven divine beings (Amesha Spenta) in Zoroastrianism (the Amesha Spentas are not messengers, but emanations of Ahura Mazda ("Wise Lord," God); they appear in an abstract fashion in the religious thought of Zarathushtra). The number of angels is enormous. Jacob meets a host of angels; Joshua sees the "captain of the host of the Lord"; God sits on a throne, "all the host of heaven standing by Him on His right hand and on his left"; the sons of God come "to present themselves before the Lord" (Gen. 32:2; Josh. 5:14-15; 1 Kings, 22:19; Job 1:6, 2:1; Ps. 89:6; Job 33:23). In the Book of Revelation, the number is "a thousand thousands, and many tens of thousands." The general conception is the one of Job 25:3: "Is there any number of his armies?" The Bible mentions other subordinate divine beings, such as the cherubim who guard Garden of Eden (Gen. 3:24) and the winged seraphim whom Isaiah sees in his vision of Yahweh's throne—superhuman beings with six wings who were Yahweh's attendants (Isa. 6:2). Ezekiel gives elaborate descriptions of cherubim—which for him are a class of angels. A comprehensive list would also include the Hayyoth ("living creatures"), Ofanim ("wheels"), and Arelim (Thrones) (Ezek. 1:5). God is described as riding on the cherubim and as "the Lord of hosts, who dwells between the cherubim." In the Book of Daniel (second century B.C.E. ), there occur the names Michael and Gabriel. Michael is Israel's representative in heaven, where other nations—the Persians, for instance—were also represented by angelic princes. In the apocryphal books of Tobit and Enoch, the list of named archangels expands to include Raphael, Uriel, Raguel, Sariel, and Jerahmeel. The development of the doctrine of an organized hierarchy of angels continues into the Jewish literature of the period 200 B.C.E. to 100 C.E. In the New Testament, continuous with the Hebrew Bible, angels appear frequently as the ministers of God and the agents of revelation: Matthew 1:20 (to Joseph), 4:11 (to Jesus), Luke 1:26 (to Mary), Acts 12:7 (to Peter). Jesus also speaks of angels as fulfilling such functions (Mark 8:38, 13:27). Angels are most prominent in the Apocalypse. 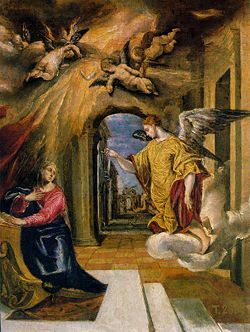 The archangel Gabriel appeared to Mary in the traditional role of messenger to inform her that her child would be the messiah, and other angels were present to herald his birth. In Matthew 28:2, an angel appeared at Jesus' tomb, frightened the Roman guards, rolled away the stone from the tomb, and later told the myrrh-bearing women of Jesus' resurrection. Alternately, in Mark 16:5, the angel is not seen until the women enter the already-opened tomb, and he is described simply as "a young man." In Luke's version of the resurrection tale (Luke 24:4), two angels suddenly appear next to the women within the tomb; they are described as being clothed in "shining apparel." This is most similar to the version in John 20:12, where Mary alone speaks to "two angels in white" within the tomb of Jesus. Two angels witnessed Jesus' ascent into heaven and prophesied his return. When Peter was imprisoned, an angel put his guards to sleep, released him from his chains, and led him out of the prison. Angels fill a number of different roles in the Book of Revelation. Among other things, they are seen gathered around the throne of the trinity singing the thrice-holy hymn (Rev. 4:6-8). The New Testament takes little interest in the idea of the angelic hierarchy, but there are traces of the doctrine. Ranks are implied: archangels such as Michael (Jude 9), principalities and powers (Rom. 8:38; Col. 2:10), thrones and dominions (Col 1:16). Angels occur in groups of four or seven (Rev 7:1). The angels of the Seven Churches of Asia Minor described in Revelation 1-3 are probably guardian angels, standing to the churches in the same relation that the angel-princes in Daniel stand to the nations; practically the angels are personifications of the churches. In Psalm 82, God sits in judgment upon the "gods" or "sons of the Most High." These angelic beings are condemned for their unrighteous deeds, for walking about in darkness. Also called "princes" (82:7), they are most likely the ruling deities of the nations that oppose Israel. In Daniel, these "princes" are the guardian angels of the heathen nations who oppose Michael, the guardian angel of Judah (Dan. 10:13, 10:18-21; 12:1). In Tobit, we find Asmodeus the evil demon (τὸ πονηρὸν δαιμόνιον), who strangles Sarah's husbands, and also a general reference to "a devil or evil spirit" (Tobit 3:8, 17; 6:7). In the Book of Job, the "sons of God" (bne Elohim) appear as attendants of God, and amongst them is Satan (Hebrew: ha satan), who takes on the role of public prosecutor, the defendant being Job (Job 1:2). In Zechariah, Satan also appears as a prosecutor, accusing the high priest before the divine tribunal (3:1). While some scholars see the role of Satan in the Hebrew Bible as acting entirely within the purview of God's subordinate and faithful servant, in both cases there is clearly a difference between Satan's opinion and God's view of the situation. Satan in fact contradicts God's will in 1 Chronicles 21:1, inciting David to sin. 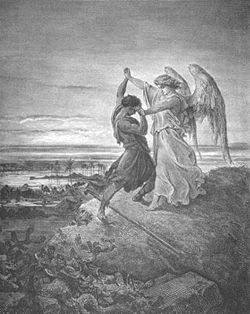 In the New Testament Epistle of Jude, the devil is said to have contended with the archangel Michael over the body of Moses (Jude 9). It is not far from this role for Satan as angelic adversary, combined with belief in wars between contending angelic armies, to the New Testament's depiction of Satan as the chief of a host of evil angels who make war on the armies of God (Rev. 12:7-9). One of his presumed lieutenants, the leader of a host of scorpions from the Pit, is an angel named Apollyon (Rev. 9:11). Satan, whom Jesus also called Beelzebul, and the rest of the demons are thought to be angels who rebelled against God and were expelled from heaven. Before the age of interfaith, many Christians also considered other religions' gods as rebellious celestial spirits. When men began to multiply on the face of the ground, and daughters were born to them, the sons of God (bne Elohim) saw that the daughters of men were fair; and they took to wife such of them as they chose. Through his sexual dominion over the hapless human beings, Satan would corrupt them and gain power over them, and over the entire human world; by this he overturned God's plan to have angels keep the position of servants to human beings, whom He created as his sons and daughters to enjoy a greater love. In the Hebrew Bible, angels often appear to people in the shape of humans of extraordinary beauty, and often are not immediately recognized as angels (Gen. 18:2, 19:5; Judg. 6:17, 13:6; 2 Sam. 29:9); some fly through the air; some become invisible; sacrifices touched by them are consumed by fire; and they may disappear in sacrificial fire, like Elijah, who rode to heaven in a fiery chariot. An angel appeared in the flames of the thorn bush (Gen. 16:13; Judg. 6:21, 22; 2 Kings, 2:11; Exod. 3:2). They are described as pure and bright as Heaven; consequently, they are said to be formed of fire, and encompassed by light (Job 15:15), as the Psalmist said (Ps. 104:4): "Who makes winds his messengers; his ministers [angels] a flaming fire." Some verses in the Apocrypha/Deuterocanon depict angels wearing blue or red robes. Though superhuman, angels can assume human form; this is the earliest conception. Gradually, and especially in post-Biblical times, angels came to be bodied in a form corresponding to the nature of the mission to be fulfilled. Angels bear drawn swords or other destroying weapons in their hands and ride on horses (Num. 22: 23, Josh. 5:13, Ezek. 9:2, Zech. 1:8). It is worth noting that these angels carry items that are contemporary to the time in which they visit. A terrible angel is the one mentioned in 1 Chronicles 21:16 and 30 as standing "between the earth and the heaven, having a drawn sword in his hand." In the Book of Daniel, reference is made to an angel "clothed in linen, whose loins were girded with fine gold of Uphaz: his body also was like the beryl, and his face as the appearance of lightning, and his eyes as lamps of fire, and his arms and his feet like in color to polished brass, and the voice of his words like the voice of a multitude" (Dan. 10:5-6). In visual portrayals beginning at the end of the fourth century C.E., angels were depicted with wings, presumably to give an easy explanation for them traveling to and from heaven. In Christian art, the use of wings is an iconographic convention that is intended to denote the figure as a spirit. Depictions of angels in Christian art as winged human forms, unlike classical pagan depictions of the major deities, follow the iconographic conventions of lesser winged gods, such as Eos, Eros, Thanatos and Nike. Despite their being depicted as human in appearance, many theologians have argued that angels have no fixed physical form, but can incarnate in whatever form is pleasing or appropriate to the viewer. Medieval theologians taught that angels are able to reason instantly, and to move instantly. They also taught that angels are intermediaries to some forces that would otherwise be natural forces of the universe, such as the rotation of planets and the motion of stars. Angels possess the beatific vision, or the unencumbered understanding of God (the essence of the pleasure of heaven). This leads Aristotle in turn to the demonstrated fact that God, glory and majesty to Him, does not do things by direct contact. God burns things by means of fire; fire is moved by the motion of the sphere; the sphere is moved by means of a disembodied intellect, these intellects being the 'angels which are near to Him', through whose mediation the spheres [planets] move... thus totally disembodied minds exist which emanate from God and are the intermediaries between God and all the bodies [objects] here in this world.... For you will never in Scripture any activity done by God except through an angel. And "angel," as you know, means messenger. Thus anything which executes a command is an angel. So the motions of living beings, even those that are inarticulate, are said explicitly by Scripture to be due to angels. One can perhaps say that Maimonides thus presents a virtual rejection of the "classical" Jewish view of miracles; he and others substitute a rationalism that became more popular in the twentieth century. Some Jews view Maimonides' statements as being perfectly in keeping with the continued evolving of Jewish thought over a period of several millennium. Some medieval Christian philosophers were influenced by the views of Maimonides, and accepted his view of angels. Today, his views about angels are still accepted among many mainstream Christians. Christian thought about the angels during the Middle Ages was much influenced by the theory of the angelic hierarchy set forth in The Celestial Hierarchy, a work of Pseudo-Dionysius the Areopagite, an unknown fifth-century author (or authors) writing in the style of Dionysius the Areopagite. The creeds and confessions do not formulate any authoritative doctrine of angels. However, in an age when God was often portrayed as so transcendent as to have no real relationship with mortals on earth, the principle of continuity seemed to require the existence of intermediary beings—these are the angels, arranged in ranks from those closest to God to those who come into direct contact with humans. According to this tradition from The Celestial Hierarchy, angels are organized into three major hierarchies which are subdivided into nine orders called Choirs, from lowest to highest: Angels, Archangels, Principalities, Powers, Virtues, Dominions, Thrones, Cherubim, and Seraphim. The Cherubim and Seraphim are typically closest to God, while the Angels and Archangels are most active in human affairs. Many of these names come from verses in the Bible which would appear at first to be referencing a literal thing, although retroactively suggesting that they really mention angels can also make sense in the context. For example the verse in Paul "our struggle is not with earthly things but with principalities and powers" (meaning according to most theologians the fallen angels of those choirs, used as an example of all the fallen angels). Rabbinic Judaism has another tradition about angels that runs entirely counter to the theory of angelic hierarchy: the talmudic tradition that human beings are superior to angels (compare 1 Cor. 6:3). In a midrash on Psalm 8, Moses defeats the angels in a debate about whether humans are worthy to receive the Torah, the "glory of God" (Tractate Shabbat 88b-89a). The lesson is that human life on earth is more excellent than that of angels in heaven, because only earthly humans are given responsibility to keep the laws of God. This supreme privilege of human beings makes them worthy to receive the law, which angels do not need, and do not receive. Some Christian traditions hold that angels play a variety of specific roles in the lives of believers. For instance, each Christian may be assigned a guardian angel at their baptism (although never defined by the Anglican, Catholic, or Orthodox churches, nevertheless it is personally held by many church members and most theologians). Each consecrated altar has at least one angel always present offering up prayers, and a number of angels join the congregation when they meet to pray. In the story of the 40 martyrs of Sebaste, in which 40 Christian Roman soldiers were made to stand naked on a frozen lake in the snow until they renounced their faith, angels were seen descending from heaven placing the crowns of martyrs on their heads. In many informal folk beliefs among Christians concerning the afterlife, the souls of the virtuous dead ascend into heaven to be converted into angel-like beings. The Bible does state that at the resurrection people will be like the angels with regard to marriage and immortality (Luke 20:35-36), and teaches such a transformation. For instance, at 1 Corinthians 15:51, it states that the saints will judge angels. However, official doctrines of most evangelical churches teach that the virtuous are resurrected at the end of time, having a physical body again, unlike angels. Jesus seemed to imply in one saying that angels do not marry (Mark 12:25). However, there is a widespread tradition of married life in heaven. Zechariah 5:9 can be interpreted that there are also female angels. Paul's statement that women should wear a veil "because of the angels" (1 Cor. 11:10) has been interpreted to mean that male angels could be vulnerable to female attractiveness. The Christian mystic Emanuel Swedenborg in his late work Conjugial Love describes that a soul of a man and a soul of a woman are united by marriage in heaven, thereby becoming angels. The belief in angels is central to the religion of Islam, beginning with the belief that the Qur'an was dictated to the Prophet Muhammad by the chief of all angels, the archangel Jibril (Gabriel). Angels are thus the ministers of God, as well as the agents of revelation in Islam. In Islam, angels are benevolent beings created from light and do not possess free will. They are completely devoted to the worship of God (Allah) and carry out certain functions on His command, such as recording every human being's actions, placing a soul in a newborn child, maintaining certain environmental conditions of the planet (such as nurturing vegetation and distributing the rain) and taking the soul at the time of death. Angels are described as being excessively beautiful and have different numbers of wings (for example, Gabriel is attributed as having six-hundred wings in his natural form). They can take on human form, but only in appearance. As such, angels do not eat or procreate as humans do. In this view, angels, unlike the fiery nature of jinn, are beings of goodness and cannot choose to disobey God, nor do they possess the ability to do evil. The archangel Jibril (Gabriel) is attributed with sending the messages of Allah to all the Prophets. Other angels include Michael (Mikaeel) who discharges control of vegetation and rain, Sarafiel (Israfil) who will blow the trumpet on Yaum al Qiyamah (the day of resurrection), and Azrael (Izra'il), the angel of death. The angels Nakir and Munkar are assigned to interrogate the dead before judgment day; and there are nineteen angels over-seeing the punishments of hell unflinchingly (Q 74:30). There are eight massive angels that support the Throne of God (Q 69:17). Every human being is assigned two angels to scribe a record of all actions done by the individual throughout their life, which will be used in evidence for or against the person by Allah on the day of judgment. Humans do not turn into angels upon death, rather they are physically resurrected in body and soul and judged by God on judgment day (and that should they end up in Jannah (heaven), they are given perfect bodies). 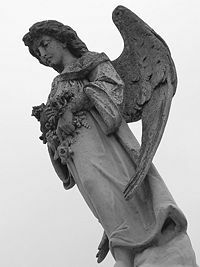 Some of Smith's associates who claimed to have received a visit by an angel eventually became disaffected with Smith and left the church, yet none of them retracted their statements that they had seen and conversed with an angel. Names of the angels who allegedly appeared to the members of the Mormon community are: Moroni, Nephi, Peter, James, John and John the Baptist. Mormons believe that the angels all once lived as earthly people; thus Michael, the archangel, was Adam (the first man) when he was mortal, and Gabriel lived on the earth as Noah (the one who built the ark). Hinduism uses the term devas to refer to divine beings that are comparable to angels. They are celestial beings with supernatural powers, but also weaknesses. They grant material benefits to humans who pray and make offerings to them, though they do not carry the message of Ishvara to the humans as in Abrahamic religions (a category of such beings also exist, called "devaduta" or "duta"). Examples of such devas are Indra, Mitra, Ashvins and Varuna. Buddhism and Jainism also believe in the existence of devas. The Tibetan Book of the Dead, and popular Buddhism generally, describes one of their functions as the judges who hold court in heaven to judge each soul by its deeds and decide its fate. Popular Daoist texts like Tract of the Quiet Way describe guardian angels that guide and protect the doers of good. Angel-like beings called Tennin and Tenshi appear in Japanese mythology. Modern-day Christians report receiving angelic help just as did the disciples in biblical times. For example, Corrie Ten Boom (The Hiding Place) tells of angels making her invisible to the Nazi guards who were searching a group of prisoners—a "miracle" that saved her life—reminiscent of St. Peter's experience of an angel releasing him from prison in Acts 12:7. The sense of nearness to angelic help is heightened for those who believe that humanity is entering a "New Age." The New Age, it is said, is a time when the Earth is going through massive changes, when the old barriers dividing humanity are crumbling, and when people are experiencing unprecedented healing. The "veil" between the spirit world and the physical world is becoming thinner. In this situation, it is believed that countless angels have been activated to work on the earth to help people find their way to a new life with God. Accordingly, some writers insist that is beneficial to recognize the service that angels are providing, and even to call on them, inviting them into our lives. The angels that invisibly surround each person actually want to be directed by the humans whom they are to help. Angels are not omniscient, it is said; they can better serve their earthly counterparts if they are given an order. It is recommended that a person cultivate his or her own personal "angel band" to work with them and prosper their activities—but it only works if they are living in service of God and others. ↑ Nora M. Spurgin, Circles of Angels (HSA Publications, 1999, ISBN 0910621969). Cheyne, James Kelly (ed.). 1899. Angel. Encyclopædia Biblica. New York, Macmillan. Hastings, James (ed.). 1898. Angel. A Dictionary of the Bible. New York: C. Scribner's Sons. Ronner, John. 1993. Know Your Angels: The Angel Almanac With Biographies of 100 Prominent Angels in Legend & Folklore-And Much More! Murfreesboro TN: Mamre Press. ISBN 0932945406. This page was last modified on 21 March 2016, at 14:57.